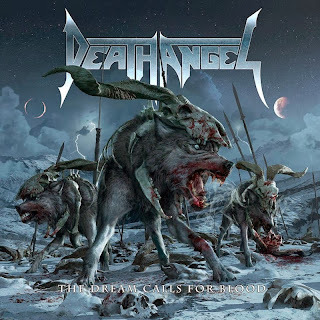 Hall of the Mountain King: Review: Death Angel, "The Dream Calls for Blood"
Review: Death Angel, "The Dream Calls for Blood"
Death Angel stands as one of the most underrated acts from the second tier of the 1980s San Francisco Bay-area thrash movement. Though not often mentioned, the band's first three albums are as solid as anything that you'll find from that era and show a great deal of musical evolution between the aggressive The Ultra-Violence in 1987 and the much more varied Act III in 1990. The band broke up after that third album, with some members going on to form a short-lived outfit called The Organization, named for a song on Act III, that built on the influences the band had shown on that record. It wasn't until 2004 that we'd hear new music from Death Angel again, as a reunited version of the band unleashed The Art of Dying, and proved that they still had the goods. The follow-up, Killing Season, may well be the equal of those early records, and the band continues to rock into its fourth reunion record, The Dream Calls for Blood. The album blasts out of the gate with one of its best numbers in "Left for Dead." 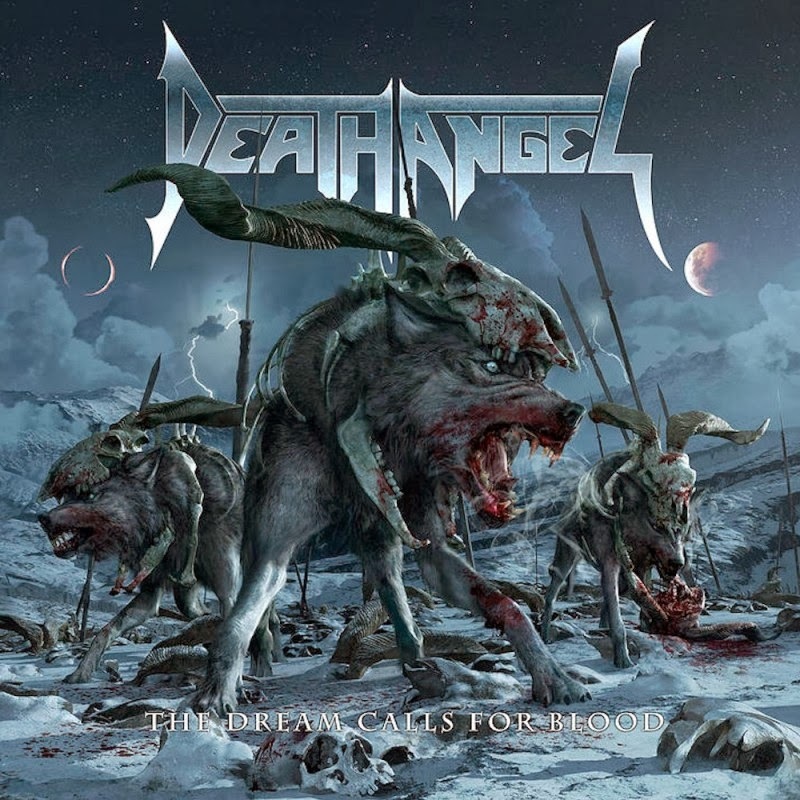 After a brief soft intro, the thrash kicks in, and it's Death Angel at their best, fast and ripping metal, but with hooks that will leave you humming the song for the rest of the day. From there, it's time to hold on to your seat. That same theme -- speed, precision and infectious melody -- runs throughout the record. "Fallen" is another great example, with insane riffing from founding member and guitarist Rob Cavestany and Ted Aguilar and Mark Osegueda spitting the vocals with venom on the verse. Then, when the chorus hits, we get a little bit of a hard rock feel creeping in with another big hook. "Empty" brings it back again with some pounding drums from Will Carroll that give way to hummable guitar riffs, and perhaps the best chorus on the record. There's kind of a spacey feel about it to match the lyrical content. The title track is a bludgeoning piece that once again brings thoughts of the band's earliest work. The melodic choruses found elsewhere give way to a more pummeling, but no less catchy, snarl that fits the violent nature of the tune. Death Angel shows some of the other sides that we've seen in the past here and there, too. Amid the pounding thrash and breakneck speeds, you'll find some nods to classic metal. "Son of the Morning," after opening with a riff that's perhaps just slightly reminiscent of Judas Priest's "The Hellion," pounds you over the head for a few moments before returning to that early theme and giving us another taste of classic metal right before the guitar solo. "Execution/Don't Save Me" breaks out the acoustic guitars for a nice neoclassically influenced duet with some mournful electric licks overlaid that I really wish lasted longer than its minute or so running time before the gallop kicks back in. But the heavier part of the song also has a nice little rhythm between the marching guitars of Cavestany and Aguilar and Osegueda's vocal delivery. 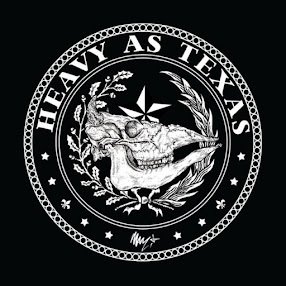 The mix of clean intro and thrashing returns on "Territorial Instinct/Bloodlust," which builds a bit more slowly from the acoustic intro to the heavy part with some very tasty lead work from Cavestany and a nice Metallica-influenced stomp on the heavier portion of the song. "Detonate," with its pounding percussion from Carroll, goes for something a little more majestic and almost symphonic in the early going, and the remainder of the song offers something a little different from the rest of the record. It's more in line with something from Act III, and it's another one of the record's finest moments. The Dream Calls for Blood marks another strong showing for the reunited Death Angel. It delivers its thrash fast, angry and aggressive, but equally memorable and melodic -- just the way I like it. Review: Iced Earth, "Plagues of Babylon"
Review: Beasto Blanco, "Life Fast, Die Loud"